"I will be comfortable for being nothing in NASA than something in Jubilee." Says Mudavadi. - Bana Kenya News, Real African Network Tubanane. Home News "I will be comfortable for being nothing in NASA than something in Jubilee." Says Mudavadi. "I will be comfortable for being nothing in NASA than something in Jubilee." Says Mudavadi. The ANC leader Musalia Mudavadi has broken the Ice over his stay in the opposition coalition and the NASA flag stalemate. 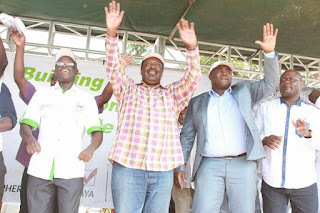 Speaking in Kilifi, Mudavadi said that he will be comfortable being a chief minister or any other post in NASA than being anything in the corrupt, lying and dubious jubilee government. The ANC leader said, "I would rather be a chief minister in a government that is dedicated to lowering the higher unemployment rate in Kenya, growing the Kenyan economy, taming inflation, and improving the lives of Kenyans than lead ANC to the polls alone." "The lessons of 2013 are very clear to me and all Kenyans when we elected people who had cases at the Hague now Kenyans are harvesting what the planted. Kenyans must not complain about food prices and the high cost of living but they need to think of whatever they did in 2013. " "Our commitment to the Kenyan people is solid and our resolve to emancipate our people is stronger than ever before. Our agenda is simple: make Kenya work for the million citizens struggling with unemployment, higher food prices, higher inflation, low wages, higher taxes, etc under the Jubilee administration." Mudavadi added. "We will have a presidential candidate in due time, but most importantly, we have a team focused on securing a prosperous future for Kenyans. Any of us is qualified to lead the team; Be it Raila Odinga, Kalonzo Musyoka, Musalia Mudavadi or Moses Wetangula. Let our supporters not lose focus of removing this incompetent, corrupt, and lying government from the leadership of this nation." Mudavadi said. This comes after the wiper leader vowed to be in NASA forever. The wiper leader Kalonzo Musyoka said that it will be better to be a sweeper in NASA than being a Minister in the Jubilee Government. Both leaders have sacrificed their time and zeal to take this country out of the poverty and Graft from the current government.